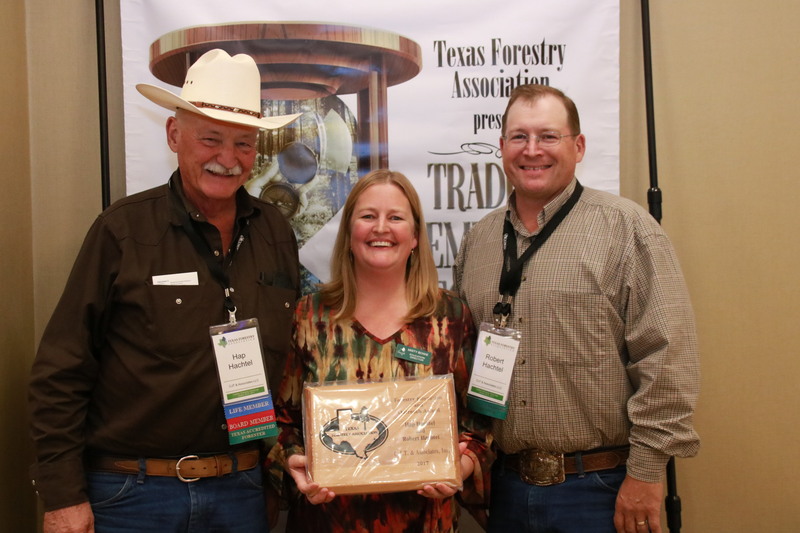 LUFKIN, TEXAS – Texas Forestry Association presented the Outreach and Education Award to CJT and Associates during the Association’s annual convention held at The Fredonia Hotel in Nacogdoches, Texas. In July, the Hachtels, along with their technician Mark James, hosted a half-day of the weeklong Teacher Conservation Institute which included a hayride tour of a local tree farm, speaking about the importance of managing family forests to optimize health, productivity, aesthetics, wildlife, and recreational value. CJT and Associates were instrumental in staging the 60th Southern Forestry Conclave hosted by Stephen F. Austin State University’s Arthur Temple College of Forestry and Agriculture in March of 2017 where they located and secured access to competition sites for timber cruising, pole classification, and compass and pacing. Both were on site during the events to assist as needed. Additionally, the company has provided hardwood logs for ATCOFA field station students to use for sawmilling during past Field Stations. Currently, Hap and Robert manage TFA’s Tree Farm and the Griff Ross Woodland Trail located in Rusk County. Hap Hachtel and Robert Hachtel, father and son behind CJT and Associates, received the Outreach and Education Award, presented by TFA Environment Education Director Misty Bowie, during Texas Forestry Association’s annual convention held October 25-27, 2017 held at The Fredonia Hotel in Nacogdoches, Texas.